Dorsum, venter and leg I of Dampfiella cejansis, from Norton & Behan-Pelletier (2009). 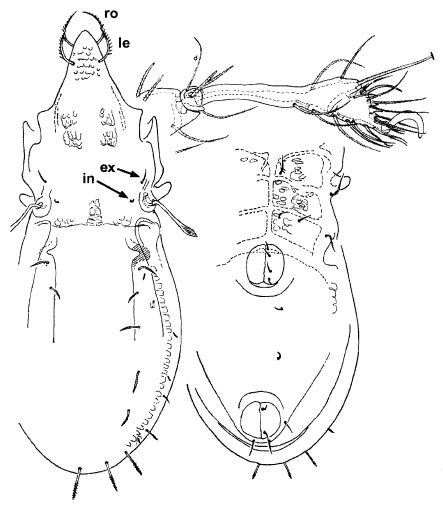 The Dampfiellidae are a pantropical group of oribatid mites that are diverse in lowland rain forests (Norton & Behan-Pelletier 2009). Characters (from Norton & Behan-Pelletier 2009): Length 600–1400 µm. Prodorsum with costulae; porelike alveolar vestige of second exobothridial seta present. Notogaster narrow, about twice as long as wide, with strong depression laterally between setae c and la. Genital plates with three or four pairs of setae. Tarsi and tibiae functionally fused, moving as single segment. Norton, R. A., & V. M. Behan-Pelletier. 2009. Suborder Oribatida. In: Krantz, G. W., & D. E. Walter (eds) A Manual of Acarology 3rd ed. pp. 430–564. Texas Tech University Press. [S04] Subías, L. S. 2004. Listado sistemático, sinonímico y biogeográfico de los ácaros oribátidos (Acariformes, Oribatida) del mundo (1758–2002). Graellsia 60 (número extraordinario): 3–305.